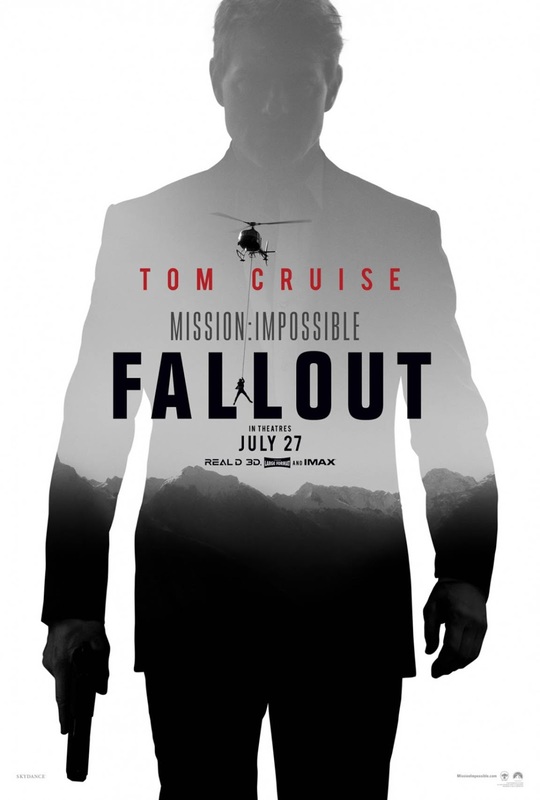 THE TEERITZ AGENDA: Sunday, August 12th, 2018 - Still Kickin', "Mission: Impossible - Fallout", Aching Blades & Recent Wristwatches. Sunday, August 12th, 2018 - Still Kickin', "Mission: Impossible - Fallout", Aching Blades & Recent Wristwatches. It was the Oris Movember Edition Diver SixtyFive on a plain black NATO strap. Very comfy to wear. It's resting on a bone-coloured H&M denim jacket that I picked up. I'd been passively looking for a lighter colored trucker's jacket for a while. Figured it would be good for the warmer months ahead and add a little contrast to the darker colours that I usually wear. "You should go see a movie, Dad. You keep saying you want to", my son said to me last weekend. The latest installment in the M:I franchise finds IMF agent Ethan Hunt (Tom Cruise) and his small team tasked with recovering a trio of nukes that have been procured by The Apostles, a terrorist organisation intent on setting them off at The Vatican, Jerusalem and Mecca. Behind this terror plot is a mysterious figure known as John Lark. Keeping an eye on Hunt and his team is August Walker (Henry Cavill), a CIA operative who may or may not have his own agenda. Okay, let's get things straight; when you have a government agency called the Impossible Missions Force, you're pretty much assured that John Le Carre didn't write the screenplay. This film is a big, escapist adventure and if these kinds of movies are not your cup of tea, then that's cool. Skip ahead to whatever else I end up writing about other stuff further along in this post. Whatever it is. Even I don't know right now. The movie sprints along at a good clip. Cruise is back doing much of his own stunts - he loves speeding along on a motorcycle without a helmet on - and the scenes are inventive. I can never compare these movies to the Bonds. I find the action in the M:I films over the top (not that I mind), and while Bond these days is still some kind of superman, Ethan Hunt appears to be indestructible. Say what you want about Tom Cruise. Sure, the whole Scientology thing is questionable, to say the least, but as an actor, the guy definitely has a solid work ethic and he's not afraid to show it. It would be an insurance nightmare to have your lead star zipping between cars around the Arc de Triomphe without a green-screen in sight, but the guy has the clout and the chops to be able to do it and I have to say he knows his way around a motorbike, since he's been in the saddle of one at least as far back as Top Gun in 1986. Director Christopher McQuarrie seemingly came out of nowhere when he wrote the screenplay for The Usual Suspects (Dir: Bryan Singer) in 1995. It was a clever script and he went on to write other films before slipping into the Director's chair for Way of the Gun in 2000. His screenplay for this installment features a sub-plot that ties in with the last three M:I films, effectively closing the loop on this story element's arc. McQuarrie does a great job with this film. The story is the age-old spy thriller trope concerning stolen nuclear warheads and the chase to recover them and it's good to see that a deft screenwriter can still put a new spin on a tale like this. The cinematography is wonderful, as evidenced by the short clip above. I'm a sucker for a roving camera that stays focused on a character as it does a 360 degree turn around them. The supporting cast is good, particularly Rebecca Ferguson, reprising her role from the last film, as MI6 operative Ilsa. Henry Cavill is good as CIA operative Walker. Methinks he's building up a decent resume, just in case they come knocking on his door to slip on OO7's holster once Daniel Craig hangs it up. That would suit me just fine. Cavill has a literary-Bond look about him. One can easily argue for the merits of a well-made dramatic film which gives us a well-written story, sure-footed direction, and brilliant performances that highlight the art of acting. I'll always sit down to watch a great drama. On the other hand, I can also respect and champion the sheer level of work that goes into a well-made action film. There's a stunt driver behind the wheel of every car that Cruise is dodging in that scene up above. The logistics, precision and timing involved are staggering, which is why I tip my hat to films like this, where people's health and safety are literally on the line. I wore the Omega Seamaster 300 WatchCo build at some point over the last month. I think the bracelet will need one more link in it to give a comfortable fit. I picked up this Ken Follett hardback called Jackdaws from a nearby thrift shop. Two weeks before D-Day, the French Resistance attack a chateau containing a telephone exchange vital to German communications - but the building is heavily guarded and the attack fails disastrously. Flick Clairet, a young British secret agent, proposes a daring new plan: she will parachute into France with an all-woman team known as the 'Jackdaws' and they will penetrate the chateau in disguise. But, unknown to Flick, Rommel has assigned a brilliant, ruthless Intelligence colonel, Dieter Franck, to crush the Resistance. I've never read any of Follett's work, but the guy is prolific and he's been around long enough. The premise sounded intriguing, as I don't tend to read wartime spy fiction. However, I thought I'd give this one a shot. Next to the book is an empty Teacher's Scotch Whisky bottle which might make a nice water bottle during dinner. Or it might end up in the recycle bin. I was going to write about some aches and pains that I've had for quite some time, but I think it'll even bore me to write about it. I did something to my right shoulder blade last September when I turned at the waist and leaned over across a trolley to grab a heavy parcel. A few days later, my shoulder blade felt like it had an arrow stuck in it. I found a nearby physiotherapist and he gave me a series of exercises as well as a 'dry needling' technique whereby acupuncture needles were inserted into the surrounding muscles. I saw this physio every four to six weeks. Admittedly, I didn't do the exercises on a regular basis. Further treatment was done on my neck also, as I found it difficult to turn my head around far enough when reversing the car out of the drive-way each morning. Throughout all of this, I kept thinking that all I needed was a series of stretches, to give my neck a better range of movement. The physio explained that stretching was not the answer. What I had to do was strengthen the surrounding muscles. When I later mentioned this to my wife, she said; "I've been telling you that for years! Stretching warms up the muscle so that you don't tear or aggravate it when doing weight training. You have to strengthen the muscles if you want the pain to disappear." I should have listened to her, since she is a trained masseur and was a personal trainer once. As I kept going to see the physio, new aches would manifest, culminating a month ago in a sore lower back. This pain soon settled on my right hip, towards the back. Sciatic nerve? Iliac crest? My core strength is practically non-existent, so this is something that I'll have to work on. About five years ago, I leaned forward to pull a couple of typewriters from the boot (trunk) of my car and felt a shooting pain in my lower back that had me unable to lift my foot high enough to put a sock on the next morning. Anyway, I had my last appointment with the physio a few weeks ago. I have enough exercises that I can do now, and I'll give these a proper shot and see how I go. The back pain has subsided, but my shoulder blade is a weird one, as I don't know what I might have done to set it off. Either way, I'll work on it. Jeez, that was the short version!? Sticking with the dive watch theme, I wore the Omega Seamaster Planet Ocean this week. This one has not gotten a lot of wear so far this year, but I plan to wear it more as the weather hots up. I recently sold a quartz-powered TAG Heuer Formula 1. That was a watch that never got any wear at all and I'd really like to clear out the watches that don't get much (or any) time on the wrist. Next up on the chopping block is the Omega AquaTerra Co-Axial. This 36mm watch has the same dimensions as my Omega Railmaster and I have found myself rarely wearing it over the last year or two. I'll be seeing my buddy Mike sometime over the next few weeks to see if he can shift it for me on consignment. The AquaTerra is a great watch. In certain lighting, it looks outstanding, as seen in this photo. However, my eyesight these days isn't what it was when I bought the watch back in 2006 and I find that the hands disappear against the rich, glossy black dial at certain angles. So, it's time to move this one along. After that, the Dan Henry Compressor will be the next one to go. Maybe. I'm not sure. This was a watch that I bought on a whim and in hindsight, I shouldn't have done so. It's a well-made watch for the price ($250USD) and very accurate, thanks to the Seiko NH35 calibre inside it, but with a few other watches in the collection, this one doesn't get much wear. This watch was cheap enough - in the grand scheme of things - that I could keep it as a knock-around watch for those times when I don't want to risk damaging something more expensive. Then again, if it isn't being worn, then it's just taking up space. Not a lot of space, but you get my drift. I'll have to get a sharper picture of the dial. Or you could just look at my previous post to see a slightly better photo of this watch. I love the intricacy of the dial on this watch. Especially when one considers that Oris was a lower tier brand in the mid 1990s when this watch was made and yet, here they were, making a dial with five different textures on it, thus giving the impression of a more expensive watch than it actually was. It has such a nice, classic look to it, owing much of its aesthetic to the 1938 Big Crown model on which it was based. Looking forward to when the weather warms up this year, so that I can bust open that bottle of Gordon's Pink Gin. And party like it's 1929. I don't tend to wear this one throughout the week, but it gets its turn when I get home from work on Friday afternoons. The mineral crystal has a few light scratches on it that weren't there a few months ago, but a watch IS meant to be worn. I'm still careful with it. No point tempting fate by wearing it in situations where the possibility of damaging it is heightened. After all, it's not the same watch that it was when it rolled off the production line in 1982. Well, gang, that's what I've been up to lately. It's now almost 9:00pm on Sunday night, my shoulder is reminding me that it's there, and I think I'll have a cup of tea and retire to the lounge room to slip off my shoes and see if there's anything on TV worth watching. I hope you've all been well, and I hope you have a good week. I always enjoy your posts, keep them coming. I'm not a "watch guy," but have a few solar-powered analog quartz timepieces; a cheap Seiko plastic solar dive watch and a Citizen solar. Also a manual-wind, single-hand Ukrainian watch, 15 jewel - had the crystal replaced recently and it was laminated glass/plexi. The thing is surprisingly accurate if you wind it regularly. Love the typecasts as always. I'll have to break out my Silent-Super, great machines. I have a Royal QDL here next to me on the desk, one of my best typing machines. Stay well and hope those aches heal soon. Good to see and read your typecast. Keep exercising. I have been collecting typewriters for many years now, but only recently started to get interested in watches. One thing I learned is that watch collectors like their (valuable) pieces as original as possible, preferable without ever having been serviced. Therefor, the most valuable Submariners sometimes have hour and minute markers where the tritium almost falls out. I wonder if some time in the future, collectors will treat typewriters the same way, admiring patina and worshipping discoloration of keys. Maybe you should be careful when you swap the keys of your Smith Corona! Just kidding. By the way, I am waiting for a Seiko Marinemaster to arrive in the mail. It's officially far to big for my wrist, but I decided I don't care. Do you wear your huge Hamilton sometimes (I think to remember you wrote about it a while ago)? Schrijfmachine, wristwatches are a slippery slope, to say the least. Yes, I prefer my watches to be as original as possible, but I don't want them to look like they've been thrown out of a moving car into an ocean. In recent years, watch dealers have begun using language in an effort to highlight the flaws of a watch as a positive. Hmm, I think this will be a post idea. Yes, I think I'll reply to your comment with a post.